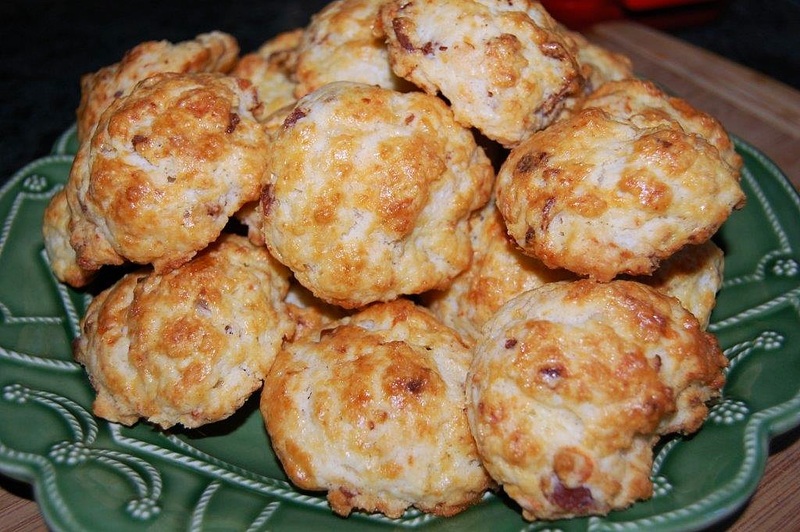 An easy and quick casual dinner party, a rich and filling salmon soup and biscones, yes biscones, scone-like biscuits loaded with butter, bacon and cheese so good that you might consider hiding them until dinner or you won’t have any left. The soup was thinner than chowder and served more than 4 guests because we served it as a cup of soup. All of the same ingredients that I would use in a chowder a good flavorful seafood or fish stock base, cream and chunks of potatoes and salmon make for a lighter version, but I suppose that with the addition of more potatoes and a quick puree of some of the soup and potatoes it would thicken. 4 cups of boiling stock, 5 large Yukon gold potatoes, peeled and diced, 2 large bay leaves fresh or dried, 1 teaspoon fresh minced thyme, *optional saffron threads, celery heart and some of the leaves chopped, 1 large shallot plus 8 cipollini onions, large dice, 1-1/2 pounds of skinless salmon, large cubes, 2 cups heavy cream, 1/4 cup bacon fat, *optional 4 tablespoons butter, cut into bits, 1/4 cup dry white wine, salt and pepper, and chopped fresh dill for garnish. Heat the stock to boiling and turn down to a simmer, briefly sauté the onions, celery and herbs in a little of the bacon fat and add to the stock. Sauté the potato cubes in the rest of the bacon fat and add to the simmering stock and cook until potatoes are soft, about 15 minutes. 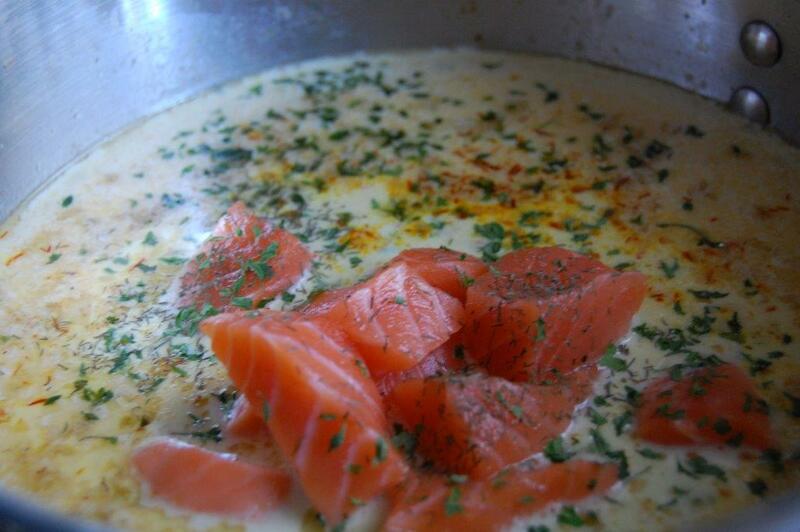 Add the wine and cream simmer 5 or so minutes then add the salmon chunks and simmer until heated through. Garnish with fresh dill or parsley. Preheat the oven to 375° and line two baking sheets with parchment paper. In a large mixing bowl, whisk the all-purpose flour with the cake flour, granulated sugar, baking powder, 3/4 teaspoon of the salt and cardamom until combined. Using a pastry cutter or two knives, work in the butter until you have various-size pieces ranging from sandy patches to pea-size chunks and some larger bits as well. Gradually pour in the buttermilk and gently fold the mixture until there are no bits of flour remaining in the bottom of the bowl. If the dough seems dry, add a little more buttermilk until it is moist and slightly sticky. Using your hands, gently pat down the dough until it resembles a loaf of bread. Using a large ice-cream scoop, scoop mounds of the dough onto the prepared baking sheets, arranging them about 1 inch apart. Lightly tap down the tops of the biscones with the scoop. In a small bowl, lightly beat the egg with a pinch of salt. Brush the tops of the biscones liberally with the egg wash. Bake for 20 to 25 minutes, rotating the baking sheets halfway through, until the biscones are golden and fully baked. Remove from the oven and let cool for 10 minutes.